The New Generation 2003 manufactured by Toynami is a wonderful superhero. Among the many major features is the 7 inches tall poseable action figure, 25 points of articulation!. Additional features consist of 5 interchangeable hands and weapon. Brand new New Generation 2003 . 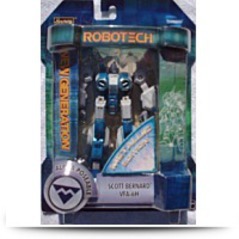 For more information on this toy, visit our affilate add to shopping cart button on this site. Made by Toynami in 2003 and long out of production. 7 inches tall Poseable action figure, 25 points of articulation! 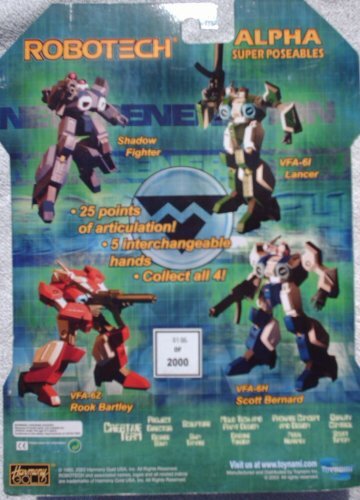 5 interchangeable hands and weapon. 2003 San Diego Comic Con Metallic Edition, Individually Numbered, limited to 2000. 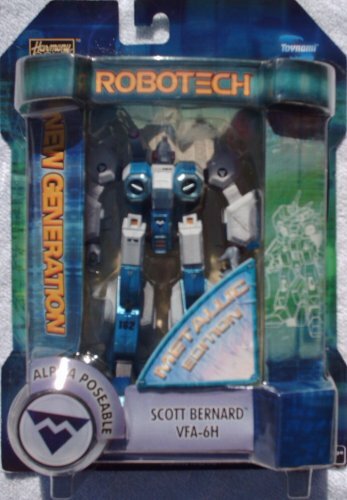 Robotech New Generation 2003 San Diego Comic Con Exclusive Metallic Edition Scott Bernard VFA-6H Alpha Super Poseable Action Figure. Individually numbered and limited to only 2000 produced. Does'nt transform. Comes with 5 interchangeable hands and weapon. 7 inches tall Poseable action figure with 25 pionts of articulation. Made by Toynami in 2003 and long out of production.